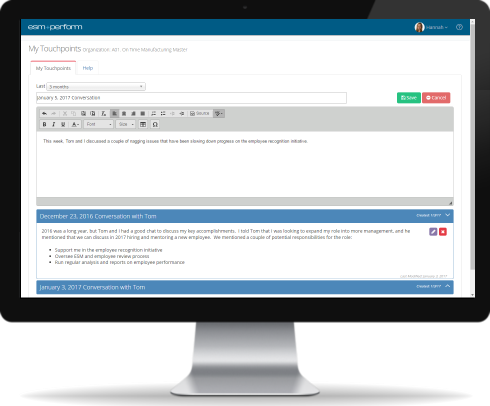 Employee reviews have never been easier for HR, managers, and employees. Employees create strategy-driven goal plans. For consistency, administrators can assign goals and measures to groups of employees. Managers sign-off on each employee's goal plan to ensure everyone is on the same page.. Improve manager-employee communication with self-evaluations. 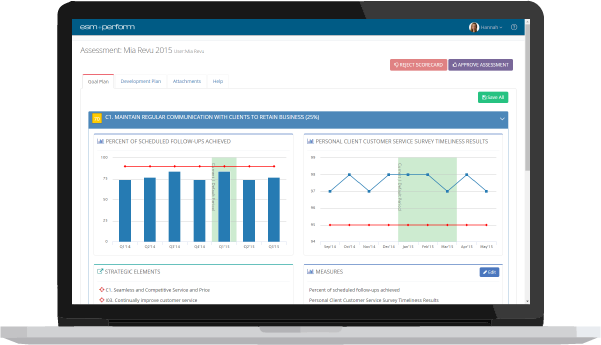 Employees can track personal KPI progress and reflect on their own performance. Managers quickly view the employee's own evaluation and draft their own final review of goals. Use this step to verify employee KPI data. HR administrators can choose to sign-off on the the final manager-employee review document..
Employees view their final evaluation document and provide an electronic signature to close out the review. Eliminate paper reviews. 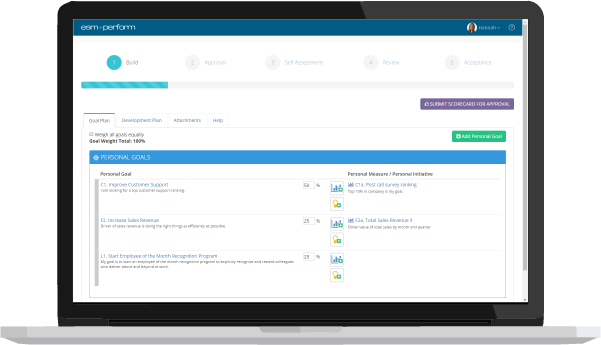 Simplify your employee appraisal process with ESM's workflow-driven employee review software. Create organizational alignment by directly linking employee goals and measures to the organizational strategy map. Automatically track Personal Balanced Scorecards and KPIs across teams and quickly create dashboards that show performance in relation to your strategy. More organizations are moving towards frequent, informal manager-employee conversations. ESM helps by providing you with a single employee performance appraisal tool to capture big ideas from quick conversations. Struggling to align employees to strategy? Check out our guide to effective strategy-human capital alignment. Do you like instant price quotes? We do. You don't want to waste months in complex employee performance review software implementations. Let us do the heavy lifting. We'll have your organization completely ready for reviews in a couple of weeks, for absolutely zero additional cost. Ready to go? Schedule a demonstration to get started.